If you were to recognise Hale & Hearty by just one dish, it would be their pancakes. This Waterloo café is infatuating diners everywhere with its thick, majestic pancake towers, which are as Insta-worthy and aesthetic as they are good for you. Hale & Hearty is fast becoming a popular eatery among brunchers who have tagged on to the superfood bandwagon. The cafe's philosophy revolves around serving honest, healthy soul food that is rich in flavour but free from the refined sugars, dairy and other ingredients that can often leave you feeling heavy and bloated. This does not necessarily mean that it's a strictly clean, sugar/dairy/gluten free wholefoods eatery. Rather, it's one that differentiates itself from others by integrating nutrient-rich, natural health foods into the diets of the every day. The menu accommodates both those who are looking for a health kick, and those who want just a little more healthy food in their life. Superfood bowls, smoothies and hearty, grain-based salads appear alongside 'European', 'Atlantic' and 'Spartan' big breakfasts, burgers and wraps. And, of course, those signature pancakes. If you have scrolled through Hale & Hearty's Instagram feed before, you will recognise these striking beauties, which are piled high and adorned with nuts, fruits and micro herbs. 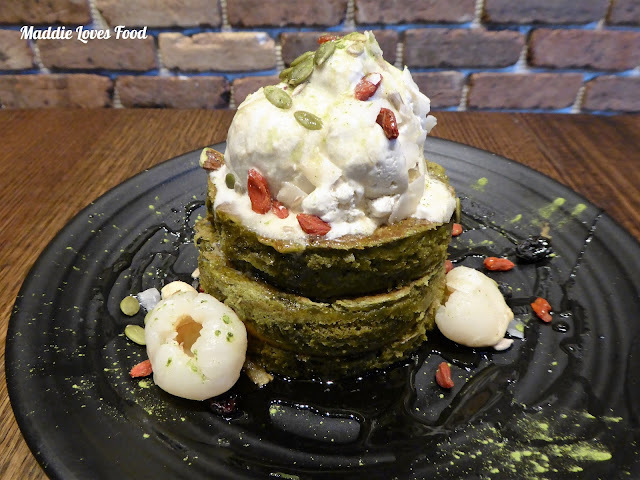 There are over 11 different varieties listed in the dedicated pancake section of the menu, which grouped into 4 categories: popular, superfood, gourmet and savoury. It's best to eat them hot off the pan, as once cool they tend to lose their light fluffiness. So take your super aesthetic picture and get on with the eating! You have probably never had pancakes like these before. They're unique in all respects, made using all natural ingredients which include organic rice flour, coconut sugar and coconut cream. They can also be adapted for vegans. Cooked on the pan just like any other pancake, these are noticeably thicker than most varieties, with a texture that is fluffy and almost cake-like. Apple pancakes take inspiration from everyone's favourite dessert, flecked with pieces of soft, poached apple and topped with mascarpone, walnuts and paleo granola. These are my favourite out of all the pancakes on the menu, and are reminiscent of a cross between an apple muffin and cinnamon doughnut. The addition of crunchy granola adds a nice texture to each mouthful, and mascarpone is a welcome creamy alternative to ice cream. The apple in the batter helps keep the pancakes wonderfully moist and soft. Contrary to what aesthetics would suggest, these chocolate pancakes are not as sweet as are expecting them to be. They have more of a clean, raw cacao flavour as opposed to that of rich chocolate. This is complemented by a slightly sour but fabulously satisfying chocolate coconut ice cream. Cacao granola and cacao nibs finish off chocolate party. Decadent but wholesome, these are a prime example of Hale & Hearty's healthy soul food philosophy. Matcha pancakes are jazzed up with the tropical fruitiness of lychees, coconut, goji berries and a mix of nuts and seeds. The big drawcard here is the vanilla coconut 'cocolicious' ice cream, which perches on top of the stack like a generous snowball. It keeps its icy form quite well compared to traditional dairy-based ice creams, and the pairing of Matcha, coconut and and lychee really is a match made in heaven. Like all the other pancakes, these are not too heavy at all. Devotees of the classic blueberry pancake will appreciate these fine specimens, which are rippled with deep violet stains. A hefty dollop of coconut yoghurt is an addition that is a little out of the ordinary. It adds a rich creamy sourness to each mouthful, and the coconut flakes on top help to reiterate the tropical punch of flavours. Just because Hale & Hearty's pancakes are healthier than most, it doesn't mean that you have to miss out on the naughtier things in life. Bacon lovers will rejoice in the fact that this menu item offers both bacon and pancakes together. Alluring green pancakes are topped with grass-fed maple bacon and slices of creamy avocado. Compared to conventional pancake recipes, these do taste noticeably 'healthier'. The zucchini adds more colour to the pancakes rather than flavour, and although it is an impressive and thoughtful combination, there seems to be an element of moisture missing from this - some smashed avocado or more maple syrup would be welcome to round it all off. Bacon not your go-to? Perhaps try the sweet potato pancakes, crumbled with goats cheese, pine nuts and topped with a wedge of roasted sweet potato. It is important to note that the savoury pancakes are, by nature, not as sweet as the other varieties. These are a case in point. Sweet potato provides natural sweetness, and the flavour of the vegetable is stronger here than it was in the zucchini pancakes. While the goat's cheese adds tartness and tang, the pancakes are not quite sweet enough to balance out the cheese so the combination might be a little too much for some. It's not all about the pancakes, though. Other menu items fulfil Hale & Hearty's quest of serving rich and nourishing food without veering too far off the traditional cafe food path. Salads are both hearty and healthy, and use lean meats and grainy quinoa - one of nature's more popular superfoods. Pink rump steak is piled atop a mound of red and white quinoa, shredded carrot, chickpeas and sweet pops of raisin. It's quite a sweet salad, and the steak is plentiful and well cooked. This defies any preconceived views of grilled chicken salad as limp and underwhelming. A nutty, tangy tahini dressing brings together kale, carrot, capsicum all in one delicious bite, and the generous piling of grilled chicken has a nice golden char. Superfoods also make many an appearance on the menu, and are included in colourful, nutritious smoothies and Acai bowls. This extends to their health-conscious drinks menu as well, which features matcha, maca, turmeric and ginger-laced concoctions. All can be made to order with non-dairy milk. If you love your rich, creamy full fat milk, don't fret. Full cream cappuccinos, lattes and smoothies are also offered. The café serves DiBella coffee, but if you're looking for a delicious hot drink that is a little out of the ordinary, why not go for one of their dirty chai, peanut butter or matcha lattes? A turmeric latte is richly spiced with raw, earthy flavours. The drink is also known as 'golden milk' because of it's health benefits and bright, sunny yellow colour. It's not for everyone, but definitely one worth a try. Steaming hot chocolate has the faintest sweet-savoury hint of peanut butter that rounds out every sip perfectly. The use of organic cacao powder in this drink is miles away from the overtly sweet hot chocolates served at most cafes. It's really quite refreshing and good to know it's not all that bad for you. Even though Hale & Hearty is is a relatively small, quaint cafe, it is busy at all times of the day, and delivers guilt-free, health-conscious food that does not compromise on flavour or aesthetics. 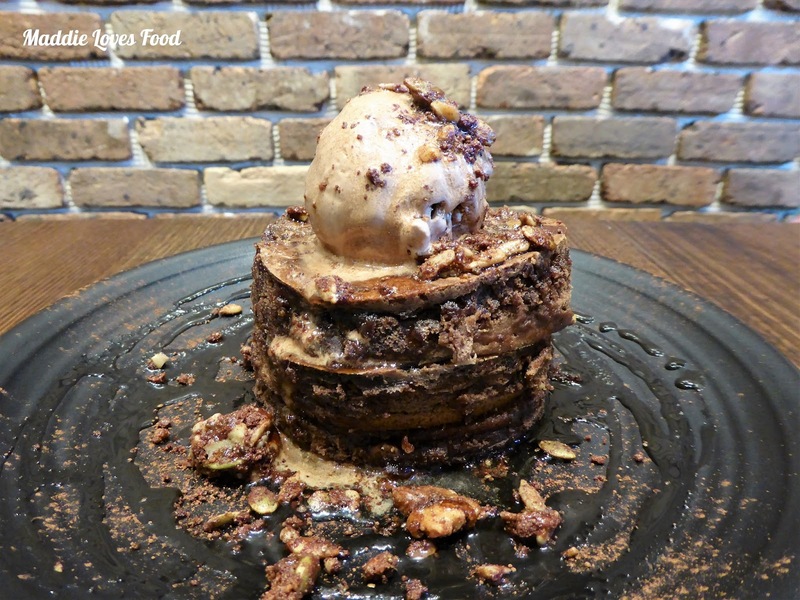 The pancakes are a must try, and we hear that their vege burgers are a popular menu item too!